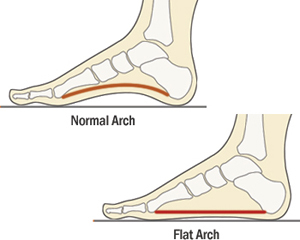 Fallen arches and flat feet are ultimately the same condition. It’s just that some people are born with flat feet, while others develop them in adulthood. In most of the population, the arch of the foot does not rest on the ground when a person stands. In approximately 20-30% of the population, the arch of the foot never develops. The entire sole of the foot lies flat, when a person stands. It is inflammation of the Achilles tendon, which is a band of fibers that runs from the lower calf to the top of the heel. It connects the muscles in the back of the leg (gastrocnemius and soleus) to the heel bone or calcaneus.